Our hearts get overloaded with stress from the day to day grind. One proven way to reduce our stress is to take a time out and do something fun and creative. Gardening is great for this. 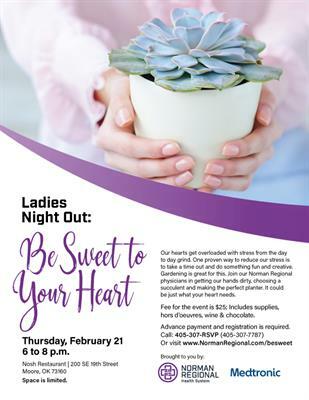 Join our Norman Regional physicians in getting our hands dirty, choosing a succulent and making the perfect planter. It could be just what your heart needs. Fee for event is $25: Includes supplies, hor d'oeuvres, wine and chocolate.